The University of Loughborough has been leading the way in establishing additive manufacturing in the construction sector for more than ten years now. 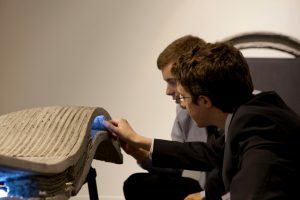 The School of Civil and Building Engineering has won acclaim with its innovative process for 3D printing with concrete, and is working closely with industry leaders such as Skanska and the Manufacturing Technology Centre to establish this as a viable tool for a wide range of construction applications. RP Platform was fortunate enough to sit down with Dr Richard Buswell to discuss the cutting-edge research taking place at Loughborough, the challenge of introducing a new technology to a conservative industry, and AM’s part in a wider move towards automation across the entire sector. My background is building energy performance. That’s what I did my PhD in, but at the time, there were some conversations going on between our civil engineering and mechanical engineering departments about additive manufacturing, which sparked my interest and I got involved from then. It was an open question. What would we be printing? How would we be printing it? None of those answers were there. In 2011 we developed our concrete 3D printing technology and then in the years since, we’ve been trying to commercialise that, working with people like Hyundai and (more recently) Skanska to push the technology out there. We came up with an idea and we’ve proved its viability in the lab, but if it’s got any legs, it needs to move out into the industrial arena. 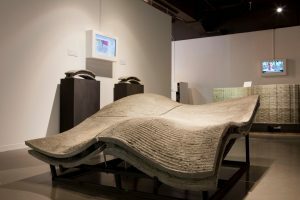 How did you arrive at 3D printing concrete, as opposed to other materials? This is a good question. It all comes down to the functionality of the components you want to make. We create buildings out of glass, steel, timber, plaster, concrete and clay. There are very good reasons why we use these materials. They’re generally fairly locally sourced (particularly clay and concrete), they’re very robust and durable, and the industry understands them. If you’re going to produce something that’s going to be part of a building, it has to be fundamentally fit for purpose. Construction is an industry that operates on very low margins. A couple of percent profit is typical for big companies, so you’re not going to get exotic, space-age materials going into most buildings. You want to use materials that are relatively inexpensive, readily available, and fit for purpose. We had lots of discussions about this; out of the materials that are available, which ones could you apply to additive manufacturing? Clay, certainly. On the other hand, when you’re talking about steel beams and girders, there are reasons why we make stuff like that with familiar methods. Metal sintering with steel is a high-energy process, and you’ve got all the preparation costs of the materials to consider as well, so it’s not an obvious choice for construction. When it comes down to it, concrete is a really good material. If we have a homogenous, well-compacted mix — regardless of whether it’s cast or printed — we know more or less how it’s going to perform. We know we can reinforce it to get flexural capacity, and coupled with that, there has been a lot of work on spray concretes, which are an older cousin of 3D concrete printing. My colleague, Professor Simon Austin, who’s been a partner in this work, has spent his career looking at spray concrete for repair. With bridges, for example, the concrete underneath sometimes breaks away so you can see the reinforcement. You can spray concrete onto that to repair it. There had been a lot of work done on the rheology [the study of the flow of matter] of those mixes at Loughborough, so it seemed like a natural extension to go from spraying concrete to extruding it. What it comes down to is that we’ve got a good material the industry knows and understands. We know something about the rheology and how to make it do what we want, and once you’re extruding it, you’re able to place it in three dimensions. It seemed like a sensible step. What has the uptake been like since then? The idea of 3D printing with concrete has been growing at a great rate. There are currently 30-40 projects taking place in this area internationally. A great many are looking at extrusion and building vertical walls on-site, whereas we were originally looking at generating components that get assembled into buildings. Overall, there has been a lot of interest globally. At the moment, industry is watching the technology — just understanding where it might go and what its capabilities are. I don’t think there is a clearly-defined market yet. There’s all these different ideas (people have been looking at printing low-cost housing, for instance), but until someone establishes a serious business entity that’s actually generating income, we won’t know. It was the same in the early days of additive manufacturing: it’s great for prototyping, but what else is it good for? We’re still at that first stage, because the construction industry is pretty conservative. It’s still quite new to the whole concept of 3D modelling. I think there’s a long way to go, but once one person has done it, people will start thinking about how they can apply these technologies and confidence will grow. At this point, what sort of applications are you envisaging for it? Along the journey, this has been one of the big questions. What are you going to make with it? Where’s the market? At Loughborough, we’ve produced a bench piece — an art installation. Clearly, that’s an application. I think there’s an increasing trend towards people wanting bespoke stuff like this, so wouldn’t this technology play into that market at some level? When architects and their clients want curved panels or complicated shapes — anything that requires a mould — it rapidly becomes prohibitively expensive, and while it is not going to be inexpensive with AM, it might make a complicated design a competitive option. If you make it a competitive option, then there is a market for it. I think this is all part of the wider move towards automation in construction — the removing of manual labour. Particularly in the UK, for all the infrastructure work that’s going to happen in the next 20-30 years — all the big civil projects — there simply isn’t the labour to do it. So there’s a big drive to look at how automation can help. Construction automation is an untapped market, so there’s a much bigger picture at play here. 3D printing is a nice spearhead and I’m certain it will have a niche, so I think in the coming years, we’ll see more of it in this area. For instance, the Manufacturing Technology Centre is already using our 3D printing project with Skanska to develop its construction automation wing. What sort of wider trends towards automation are you seeing in the world of construction at the moment? Some people liken this to the transition that the automotive industry went through when it moved towards automated lines. We’re looking at two very manual-based industries, where health & safety is a paramount driver. Putting people in harm’s way, dealing with harmful materials, the lifelong consequences of heavy manual work… All of those things are extremely important for the nation’s health. We’re also a nation that’s going to be getting older, so we won’t have millions of 20-year-olds to lift stuff! Things like making shutters onsite, working in the ground or at height… In these sorts of hazardous environments, if you could reduce the number of people working in them, you could reduce the chances of accidents. The challenge will be, how does the industry actually make that happen. It will affect the whole construction process, where everything has to be planned to be produced and manufactured in a certain way. In a factory, where you’re making components, you’re perhaps more able to introduce automated methods, but on-site operations are a challenge, because automation has to work with all the other elements. For it to really take hold in the industry, I think we’re talking 10-20 years, but looking at some of the early success stories, it could be sooner than that. What’s coming up for 3D printing in the very near future that’s got you most excited? Over the last few years, what’s been great is that there seems to be a huge explosion of interest internationally. I think Winsun’s 3D printed houses really made everyone sit up, so they’ve brought the spotlight to the area. Out of the back of that, there’s a RILEM committee I’m part of that looks at concrete rheology and technology. We’re working to understand more about the technical treatment of the cement mortars used in concrete printing from a material science point of view. That then will elevate understanding and support any future construction applications.